100% fan speed? I haven't seen my 750ti move from using 40% which is stock speeds. That's interesting as all the ls.io team use Pihole and we haven't encountered that problem. I'm using the stock lists provided and have no white lists. I restarted the server and now is stucked on 0 and fan is stopped.... ¿Without any change, is the fan going to work by its own (dynamicaly or static)? If I remember correctly, the 10 series don't spin up the fans until needed. I ended up just putting a Windows 10 VM together and passing a GPU to it for Plex encoding but with their lack of doing decoding in the GPU on Linux I'm starting to look more and more at Emby now. To switch or not, that's the question.... Looks like I have to pay to just test it on my mobile devices. I can't even test out the features I need without paying. $5 will give you a month to test out everything. Just be sure to cancel if it doesn't work out for you. I personally have had a lifetime emby premiere that a paid for up front for about three years now, worth every penny in my opinion. It's been almost totally maintenance free for that whole period, it just works. i have typically 1 local and 4 remote clients connected every night. I can thoroughly recommend Emby. Jellyfin is an alternative, but I wasn't too impressed with some of their behaviour initially so Emby gets my vote. The whole reason Emby went closed source was because the original Jellyfin dev forked their repo and removed all the nag screens/paywalls. Just cos you can, doesn't mean you should. Does this work with a Ryzen setup? The GPU is what matters, not CPU. everything works fine! Thanks guys! I also applied the workaround for NVDEC support on PLEX. 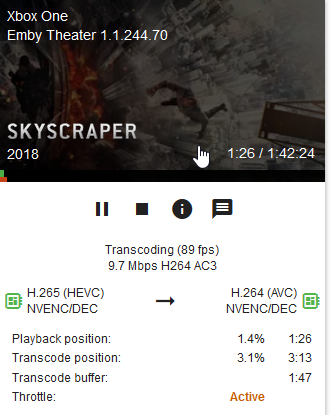 The small script that calls Plex Transcoder with the -hwaccel nvdec switch. It's only 2 lines of codes you put in a new file called "/usr/lib/plexmediaser/Plex Transcoder". Step 1. Go inside the docker PLEX terminal, to /usr/lib/plexmediaserver/. Step 2. Rename the file "Plex Transcoder" to "Plex Transcoder2"
/usr/lib/plexmediaserver/Plex\ Transcoder2 -hwaccel nvdec "$@"
There is column for enc. and one for dec., if it's not 0, it means it's working. All my services are functioning except the UI. Any ideas? Would I notice any improvements migrating from my Intel Pentium Gold G5600 Coffee Lake with iGPU to a for example Nvidia Quadro P400? It's not that you'll notice improvements. It's more you are off loading a specific job onto another bit of hardware so you can free up your CPU. Transcoding by HW with the integrated graphics of Intel does this and using low energy consumption, thats why I'm asking about performance differences and if it is worth to spend 120€. Probably not. They both do the same thing, accelerate decode/encode via a hardware chip as opposed to software on the cpu. I haven't seen any articles comparing the intel and nvidia hw transcodes head to head but would imagine they are pretty similar.